Denver is the gateway to Colorado's mountainous scenic treasures. But the city itself is worth several days on a Colorado itinerary. You'll need a travel guide to plan a budget trip. Summer offers the best chance for good weather, but all seasons are attractive. Skiers use Denver as a starting point for traveling to some of the best slopes in the Western Hemisphere. Spring can be tricky because snow in April or May is not uncommon at 5,280 feet above sea level. Weather conditions at all times of year change very quickly, which is actually one of Denver's more interesting features. Denver International Airport is a major hub and an architectural focal point. It handles about 58 million passengers a year, and that number is likely to rise with the recently announced expansion of Frontier Airlines, which operates a hub from the airport. If you find yourself here on a layover considering a run into the city, keep in mind that DIA is about 26 miles away, along a route that is frequently congested. It can take an hour or more to cover that ground during peak traffic times. Find flights to Denver. Travelers leaving downtown-bound for the airport often should allow about two hours, and even that might be tight. This is one of the nation's busiest airports, so security lines can be long, especially during the holidays. Don't get caught in a time crunch and wind up paying for a missed flight. Normally, it makes good financial sense to rent outside the airport property if possible. But make certain it saves you at least $50 USD. It can cost that much to travel between downtown and Denver International. Westword offers a list of more than 600 places in the Denver area where a cheap, filling, satisfying meal could be available. Make a list of a few that will be near your base and give them a try. The database here can be searched according to price and top reviews. Among many local favorites is the Denver Biscuit Company (141 S. Broadway), which ranks as a Certificate of Excellence winner on TripAdvisor.com. As with many popular places, lines can be long. Carelli's (645 30th St.) is a favorite Italian stop in Boulder. It's not the least expensive place to eat, but portions are large and the atmosphere is inviting. Minestrone and garlic bread are favorites. Another Boulder favorite is Basta (3601 Arapahoe Ave.), noted for great pizzas and reasonable prices. 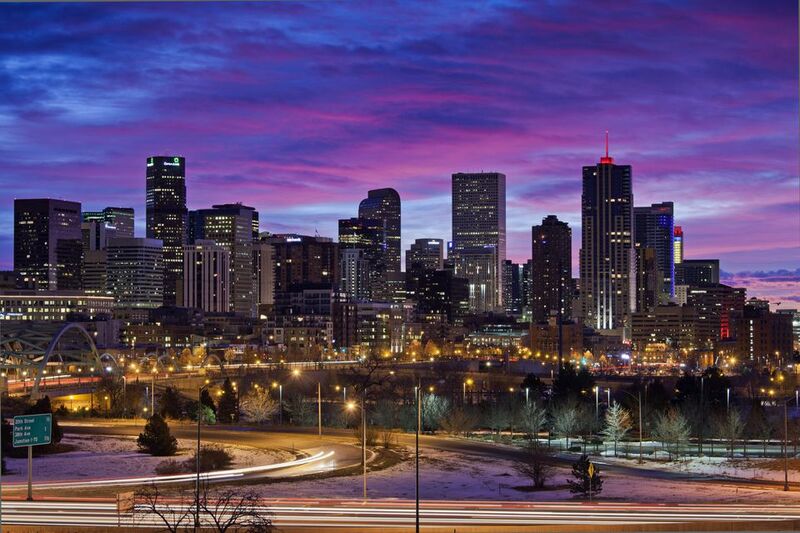 See our recommendations for the best places to stay when visiting the Mile High city. Downtown Denver's 16th Street Mall is a pedestrian-friendly corridor, but not a completely closed street. In fact, if you ever get tired of walking its sidewalks, take one of the free buses that run its length. At one end, you'll see Union Station and links to Denver's light rail system. The downtown area is very large for a city Denver's size. In fact, it's one of the largest by land area in the nation. Wide spaces describe the metropolitan area, too. A rental car usually is a must. Check out the latest entertainment information in at Denver.org. The Denver Performing Arts Complex is located close to major downtown hotels and is home to the city's opera, ballet, and symphony companies. Take I-25 north, then head west at Boulder or Longmont to enter Rocky Mountain National Park. The resort city of Estes Park is the gateway to some of the best hiking, wildlife watching, and scenery in America. If you go in winter, ask ahead about road conditions. Many of the national park roads will be closed even during the mildest of winters. Ever wanted to see Pikes Peak? It's a relatively short trip down I-25 from Denver near Colorado Springs, which is also home to the U.S. Air Force Academy, U.S. Olympic Training Center, and more. The ride shows you the scenic Front Range in all its glory, just to the west of the highway. Want a great picture? Visit the State Capitol. If you only have a small amount of free time, hitch a ride on one of the free 16th Street buses and ride to its southern terminus. From there, it's about a block to the steps in front of Colorado's gold-domed capitol building. On a clear day, you'll see Denver city hall and the Rockies in the distance. Drink plenty of water. About half the visitors to these parts suffer at least mild altitude sickness (usually in the form of a headache) if they're unaccustomed life above 5,000 feet. This can be avoided by drinking plenty of water. Find yourself a bottle and pack it with your gear for the day. Cheap souvenir? Try bringing home a fossil. There are stores here devoted to selling fossils of various descriptions that make great gifts because they're much harder to find in other places. You can buy a nice specimen for less than $20 USD.